Re-design challenge at the He-Man.org fan-art forums for the second half of March--my post is here and the original thread is here. The voting thread is here. I managed to land first place! As you can see, rather than drawing a variation on She-Ra, I tweaked the design so that she's a different character entirely. I'm happy with how the sword and star field turned out, but other than that I feel pretty lukwarm about this one. Only one thing can save this--an elaborate and nerdy background for the character, written by yours truly! 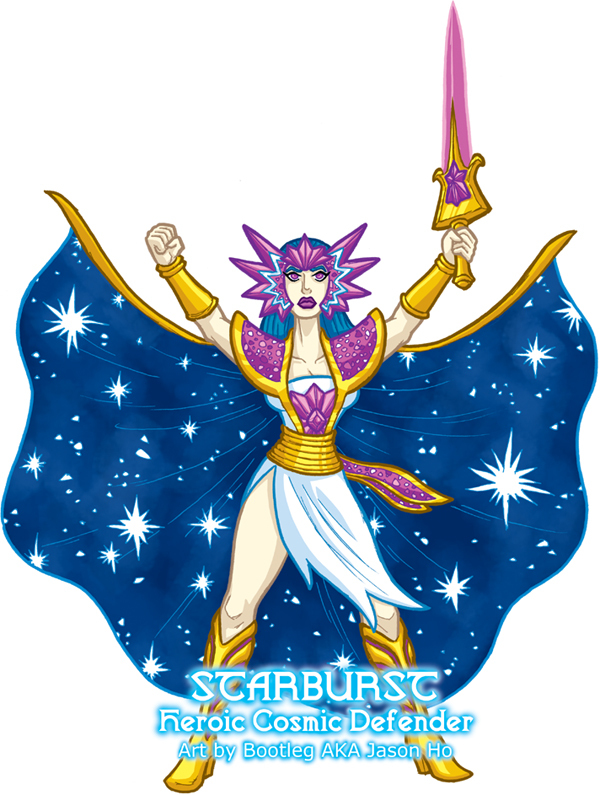 HISTORY: Over a century ago, Etheria existed in an age of peace, and Starburst was Light Hope's champion, watching over the planet, and maintaining the delicate blance of justice. A Cosmic Enforcer came to the planet, seeking Starburst's aide in battling a marauding space fleet known only as "The Horde." At Starburst's request, Light Hope permitted her to leave Etheria, hoping that with her aid, the Horde fleet could be stopped before they reached Etheria. Finally, she has returned, and none too soon--with the disappearance of He-Man, and the Horde invasion of Eternia, She-Ra has been desperately needed by Eternia and the Sorceress of Grayskull. With Starburst holding the Etherian front against the Horde, She-Ra has returned to Eternia for the time being. Accustomed to working alone, Starburst is finding it somewhat difficult to adapt to her position as one of the leaders of the Etherian Rebels. Her dedication however, is unquestionable. Starburst is just the first in a series of "original" fan-characters based on existing He-Man/She-Ra toys. Look for more in the coming weeks. I think the dress over the chest is odd. Physics would say it should arched downward, not upward, unless it's wrapped up over her breasts and then I'd say it's a foreshortening issue... does this make sense? the top of the dress arching upwards makes her chest look like it's caving in on itself. thanks! i've drawn a couple of versions of he-man since, and i'm planning on drawing up more she-ra as well.